We are still functionally iced in, at least in the way that everything outside is coated in a thick layer of ice… including both vehicles. This has been the weirdest storm however as it has clung to everything but the concrete. Additionally the temperatures have remained at just the right place to keep the ice from melting. This means for the most part the roads are completely fine. It is just lack of caring that has kept us in the house. By the manifest restlessness upstairs from my wife, I have a feeling this is coming to an end today. We honestly need to get out and about to pick up the last few gifts in order to be done for the holidays. Right now on twitter, I have the name “Belgrinch Stole Xmas” and to some extent it is not just clever use of my existing naming convention. I tend to be a big of a humbug when it comes to the holidays. Over the years bad things seem to fall near the holidays, and when you combine that with the fact that Christmas as an adult is a massive let down if you don’t have children. My wife and I have not put up a tree in over a decade. For children, Christmas still is a magical time but for me I just see the hassle of having to run between four households and shop for a bunch of people you literally only see once a year. I wish so much we could make Christmas be Thanksgiving 2.0. Thanksgiving is pretty much my ideal holiday. People get together to share a meal together, and there is no expectations past that. You just have some good food, good conversation and then everyone goes on their merry ways. Instead we have an awkward exchange of time as everyone tries to avoid the inevitable gift exchanges. This year because of my aunt’s dialysis the timing is all messed up. Normally we do all of this on Christmas eve, but instead this year everything is pretty tentative. We considered going up tomorrow so we could just spend time with the family members we want to without the rest of the three ring circus. For me it is about spending time with my parents and my grandmother… past that it just gets progressively more and more awkward. Namely I am trying to avoid being around my bigoted uncles as they seriously destroy what little inner peace I have… and make me feel absolutely dirty for being around them. I have chronicled the hunt for one-handed weapons over the last few weeks. My guildies and I have been running daily Heroic Scenarios for a shot at the 516 weapons that can drop there. 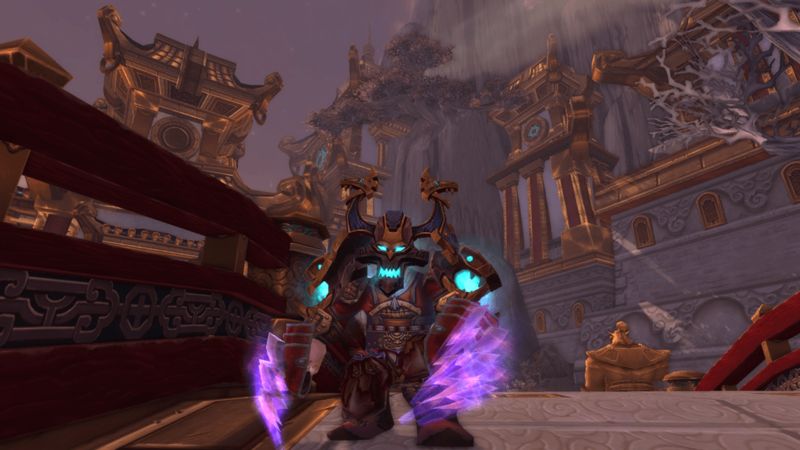 Additionally I have been working my way through both Throne of Thunder and Siege of Orgrimmar. Yesterday I spent most of the day queued for the various ToT dungeons that have a chance of dropping a weapon. Turns out the in game loot advisor thingy doesn’t list everything. It seems there is a series of weapons that can drop off every single boss in the instance, and after killing Jinrohk yesterday I managed to get one of them. The mace pictured above is Zeeg’s Ancient Kegsmasher and comes from that list of alternative drops. While not ideal, I wish it was a 2.6 speed weapon and not the awkward 2.4 speed… but it is better than what I had and I am extremely happy to get it. 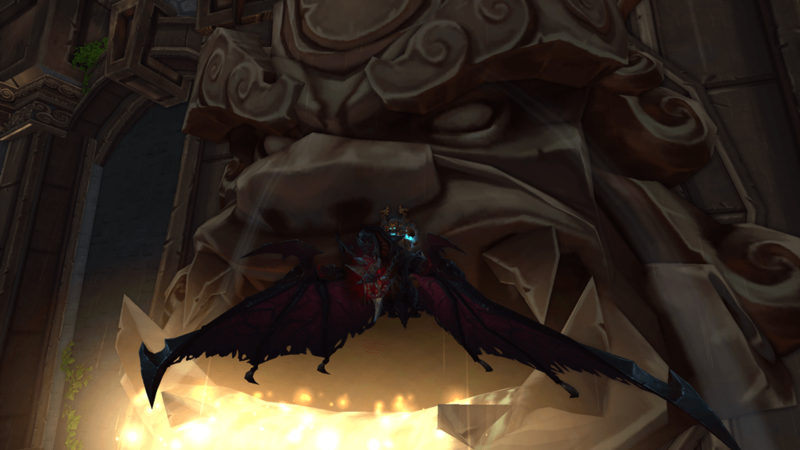 Additionally I managed to get through the Underhold section of Siege of Orgrimmar which unlocks The Downfall and a shot at another one-hander off of the Klaxxi council event. I am honestly not sure what it is about Underhold, but every single group I would get into would spontaneously disintegrate shortly after finishing Malkorok. There always seems to be either a mass exodus immediately after finishing the boss, or after failing that first time to Spoils of Pandaria. Last night… fairly late… I actually managed to find a group that oneshot every single encounter there… including captain lunchmeats himself… Thok. I won’t lie, I am not sure if I will actually ever queue for Underhold again unless a guild member needs it for something. The queue is around an hour generally, and with the lacklustre success rate it seems like a bundle of frustration I can simply live without. So I am bad at this… let me start out by saying that up front. My intent in this section is not to be “look what soandso go me, neener neener” so you are going to see some thank yous, without me actually listing who they are directed to. I figure the people read my blog and they will know it is heart felt and directed at them. First up someone very awesome got me Talisman Prologue from my steam list. This is a game that I have thought about picking up so many times in the past but never pulled the trigger. I love the Talisman board game, and even the crappy american version that Milton Bradley released called Hero’s Quest. Despite how much frustration I have built up over the years… I am still a massive fanboy for Games Workshop and Talisman seems to be one of their purest gaming experiences. Really looking forward to seeing how well the digital version translates. I am a massive sucker for the sandboxy shooter experience. Everything I have heard from friends and read has said that Farcry 3 really takes this whole concept up a notch. As a result this is one of those titles I have almost bought half a dozen times. But thanks to another amazing friend the decision was made for me. Again I plan on devoting some of my two weeks of downtime to exploring this game. Quite honestly… I have stuff on my steam wishlist as more of a reminder to myself, and because steam emails you when one of those titles goes on sale. I never in a million years expected anyone to buy me something off of it. Thank you guys very much, it made me feel loved. Last but definitely not least… the League of Legends Mystery Gift madness is back in full swing again. For those of you who are not indoctrinated, you can send a friend a random skin for one of the champions they have. The price is 450 RP but you are guaranteed to get a skin that is of higher value, but it will be assigned completely at random. The coolest part about it is there is a chance of getting skins that have long been retired or for whatever reason removed from the game. One of the skins I have always wanted but never picked up is Chosen Master Yi. Who doesn’t want to play as a Jedi Knight? Huge thanks to another good friend for sending me a mystery box and giving me this awesome skin. It is that time of the year when we naturally reflect upon what was good and not so good from the previous year. I myself am planning a post like this in the not so distant future. However this blurb is not about that at all. Yesterday the amazing Queen of Faff, Alternative Chat posted her very on audible review of the previous year. It is most definitely worth a listen, but then again everything she does is worth a listen. I have to say that while I knew of her before this year, it was a few months ago that I first listened to her podcast. I have to say I am truly thankful for discovering it, because now along with several other podcasts I look forward to hearing each episode. She brings a deeply thought out quality to the air that reminds me in many ways of NPR. I am very much an NPR junkie so I think this soft spoken and rehearsed manner suits me very well. In the podcast she has declared that 2014 will be the “Year of Faff”, and I wholly support this notion. Before her I tended to view “faffing about” as a generally negative thing. Now I have embraced my inner faffitude and find myself doing odd little things on a regular basis. I look forward to seeing what directionless madness comes form this new venture. Early in the week my good friend Rylacus, and the warden of House Stalwart while I was away… asked me if I would be willing to do an Ulduar run. He needed a single meta achievement to get his 25 man proto drake. I told him initially that I was not sure if I would be around, but if I was most certainly I would help out. I have had both the 10 and 25 man versions of the drake for quite some time, but as I know the achievements pretty well I am always willing to help out. Since last night ushered in yet another icebound weekend here in Oklahoma, I was most definitely available for faffing about in Ulduar. My only requirement was that we try and get EVERYONE that came along their drakes. No one seemed to mind and as a result we filled the ranks with tons of folks hopefully seeking their own. 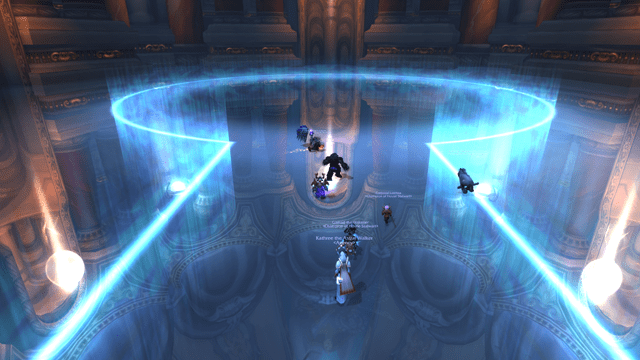 Additionally we managed to knock out Algalon, who’s room is pictured above. Most of the achievements quite honestly were pretty easy at 90, or at least easy if you knew what you were needing to do. Yog’Saron of course takes a few tries mainly to remember exactly what we need to do. The three of us that went into the portal went insane because we could not remember how to exit. We then proceeded to murder everyone else in the raid. After that little set back we pushed forward and got him on the next try earning everyone on their drakes. Currently the only really annoying meta achievement is the “kill 25 dwarves with razorscale” one. Initially we had this idea of just gathering up all of the dwarves and letting Razorscale enrage… theoretically killing them all. This would in theory kill us all, but we should have also gotten the achievement at the same time. Two things we found out… firstly the enraged flame breath is still not enough to kill a dwarf that is sitting at full health. Secondly we can easily survive the enraged form and ended up going four rounds after that in order to get all the dwarves. 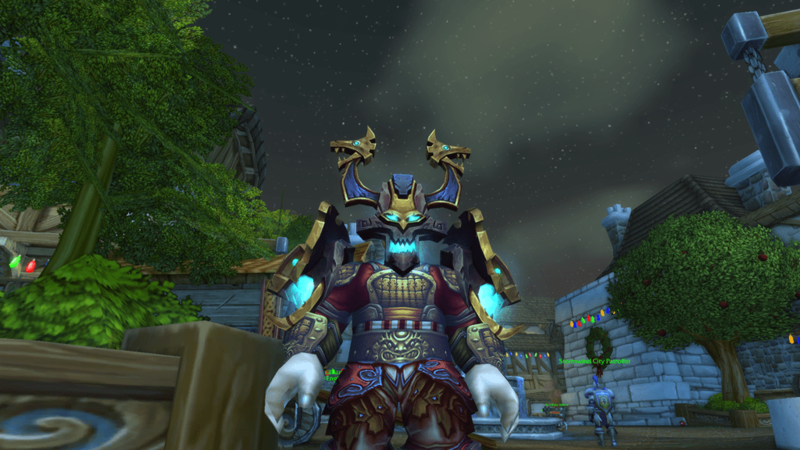 While I managed to walk away with some really cool transmoggy bits and two pieces of the tier 8 set, I did not further my overarching mission of finding some weapons for my shaman. Granted I didn’t really expect to do so in Ulduar, but the Heroic Scenario that we ran beforehand proved both painful and fruitless. My hope is today that I can finish running Siege of Orgrimmar and that the loot gods will smile on me and let me win the axe that can drop in the final part. If this continues to prove futile I may just run Throne of Thunder as well. I need to farm up the magical happy luck coins so I can turn them into extra roll chances for Siege, but I do not have the stockpile on my Shaman that I have on my other characters. 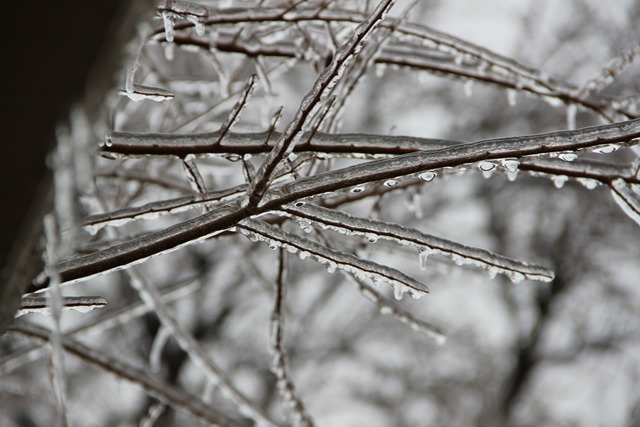 Other than this… I am going to try my best to stay warm and hopefully continue having power since the entire world outside is coated in an inch of ice. Quick… type Unicorns if you want to live! I had to share this picture as it was pretty much my favorite thing from yesterday. 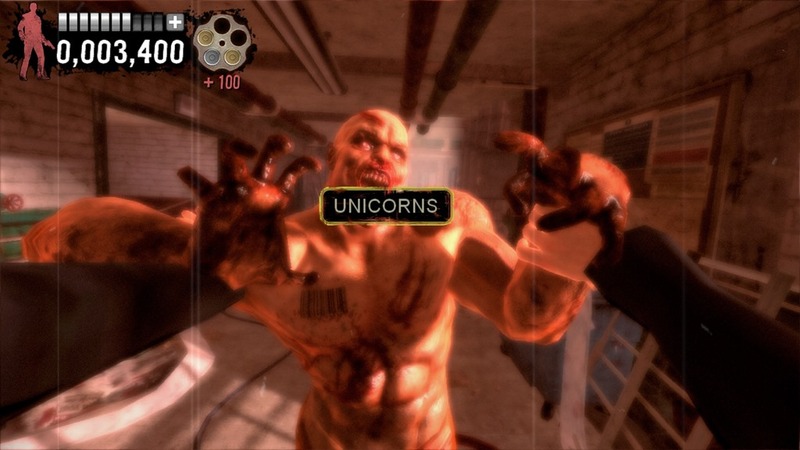 Typing of the Dead was one of the most quirky Dreamcast games I owned, so I was super shocked to see that there was a newer version available on steam. I have no real interest in playing it to be honest, but this image particularly caused me several chuckles throughout the day. I am using it this morning as a crutch to get me started typing. So far this morning I have overslept, and since I really did not do a whole lot of gaming last night, I feel fairly empty of ideas. My last night was spent with my wife, taking her shopping. I feel overall it is a noble if not maddening pursuit, but since she would be in teacher conferences tonight and Wednesday night… I figured it was a needed one. At least I got a good meal out of the ordeal. She has decided she wants to look more “put together”, and stop wearing so many neutral colors. As an art major, I keep getting called in to coordinate color palettes for her. If left to her own devices she tends to try and match everything, instead of pick a simple but coordinated group of colors. Hopefully overtime she will pick up what I am doing and I will no longer be quite so needed in the process. However for now I am her shopping buddy… but in truth I always really have been. I really like my dwarfy elemental shaman, and I pretty much play him whenever I have the chance. Right now I am on a mad quest to get him a couple of decent weapons. He currently is using two matched blue weapons, and I have been pestering the guild to run nightly heroic scenarios on the hopes that I will actually luck out like I did on the paladin. 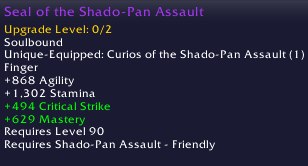 I feel like even one weapon swapped would be enough to get me into Siege of Orgrimmar LFR, which is ultimately my goal. The problem that I have mentioned before is that there are really no good weapons you can get for characters. The weapons out on the Timeless Isle are 20,000 timeless coins for a onehander, which involves quite a significant amount of grinding. 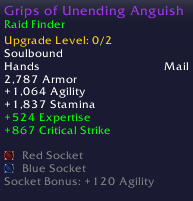 The problem with them is that they are only 476 ilevel which is not really that much better than heroic blue/crafted 463. I might be insane, but I really do not see that it is worth the copious amount of grinding that it would take to knock one of these weapons out… to wind up slightly better but still very much undergeared to do the latest content. Another option generally are the 502 living steel weapons that are remakes of the weapon specialist items from burning crusade. Two problems here, firstly they take a month of Living Steel transmutes to get. Secondly there is nothing agility based that a shaman can use, the only agility weapon is a sword. Lastly there is the option that I have been avoiding like the plague, PVP. I am not a PVP player at all, and I believe the last time I did any PVP was Baradin’s Hold. Even then it was an extreme rarity that I participated in that unless I also had a bunch of guild members backing me up. PVP is the worst sort of treadmill to me, and each time I do it I feel like a hamster as I quickly run back from the grave yard only to be sent back again. There may be a loophole I can exploit however. It seems you can convert 375 justice points into 250 honor through a vendor. So that means I need to get 2625 justice points per weapon that I can comfortably grind out in heroics. That would get me a 498 Axe or more likely the Fist weapon, as I seem to prefer those on my shaman. This is something I can likely do, as I can probably even convince guild members to “roflstomp” some heroics with me to fill the guild bank with money. We did some the other night to bump me across the threshold of being able to buy the heirloom axe for my orc warrior. This seems to be the stopping place for all of the alts in the guild, we simply cannot get decent weapons. I could probably even organize some group effort of running heroics to get people the pvp weapons. The stats are not ideal, as it has that nasty resilience stat on them… but overall just the damage alone makes it worth it. They would be more than viable for Siege and would let people get their weapons up enough to do quite a lot of other things. Granted these are not as good as the 516 ilevel weapons from heroic scenarios… however it is something you can actually work towards without having to rely entirely on that mean on random number generator. Yesterday went pretty much as I had intended it. 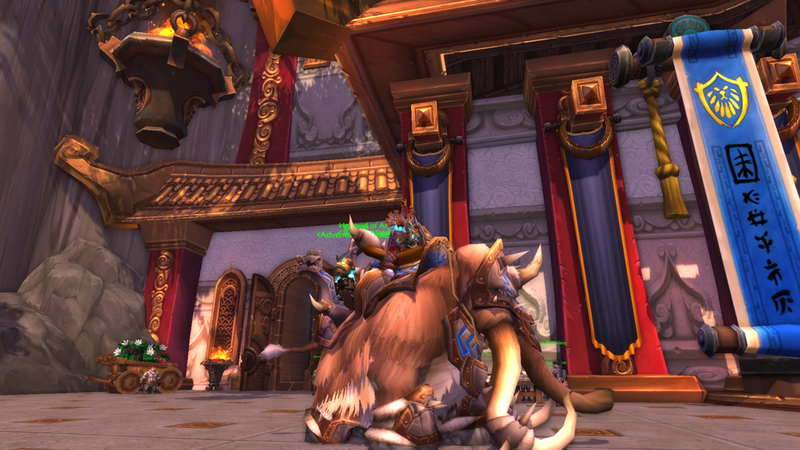 I hung out around the house and ran first my Paladin and then my Shaman through a bunch of LFR. Things went a bit slower than intended since I kept getting in on the end of a run and having to queue again to catch the first boss or two. I managed to get both characters up into the 480ish range. Still no real luck with the weapon drops, which seem to be the issue with catching characters up enough to be able to do Siege of Orgrimmar. As a result my warrior, paladin and shaman are all using 450 level weapons still, and I have not really had much luck with getting spirits of harmony on the smith to be able to bump those up to 463. Of the options I have at my disposal for weapons, none of them really seem palatable. 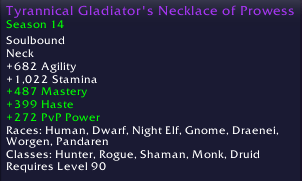 I could queue for heroic dungeons and have a random chance of getting the dungeon that drops a weapon… and a random chance on top of that of getting the weapon to drop. This would only take me to 463, so not really great in the grand scheme of things. I could farm timeless isle coins, but it takes 10,000-20,000 to be able to purchase a weapon… and in those cases the weapon is only 476 which really doesn’t help that much. So the best option still seems to be to queue for Throne of Thunder each week and hope, all the while trying to accumulate Spirits of Harmony for the smith. With all of my crafters going, I have really felt the lack of my alchemist. There are some pretty sweet items you can make as a blacksmith that are 502 ilvl but they require lots and lots of Living Steel. Once again the only way to get living steel is to get it transmuted by an alchemist. 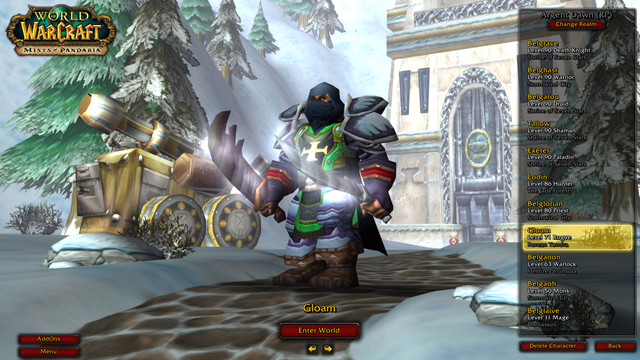 As a result I have been directing my extra effort towards leveling Gloam my rogue high enough to be able to raise his way through the Pandaria alchemy. Currently he is capped out at 450 and cannot progress again until I level 75. As a result I have been working on quests out in Borean Tundra and I almost have him up to 72. Thinking about just making a serious push to try and get him to 90. Rogues are way squishier than I remember, and while they have recuperate it doesn’t seem to offer the level of survival I am used to with my other characters. 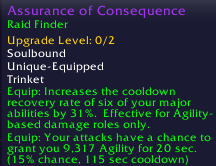 As a result leveling the rogue has been less than enjoyable. I am not really a stealthy person, and I have always played my rogues more like a swashbuckler than an assassin. However the only time combat goes really smoothly is if I make sure I stealth up and get my opening attack. Hopefully with time I will get back into the swing of playing one, as in the past… burning crusade especially my rogue was my favorite alt. The thing I find most humorous is that Paladins now kinda play like rogues. I have been doing a lot of Retribution paladin, and the mechanics are almost exactly like a rogue. Thing is in many ways it works better. Instead of everything being based on 5 combo points, all of the attacks seem to be based on 3 even though your bar can fill to 5. I keep thinking that rogues as a whole would benefit if most of the combo point dumpers capped at 3 as well. I think this is why I enjoyed my warrior in rift so much as opposed to my rogue. The three mechanic just seemed to work better, it made the game play feel more “in the moment”. Right now I feel absolutely deluged with choices anytime I play the game. At this point i have yet to run Siege of Orgrimmar LFR on Belgrave or Belgarou my two best geared characters. I am 4 coins away from getting all of my sigils of power and wisdom, so I would not mind finishing that off so I can continue down the legendary cloak line. I have not even begun to work on Belghast, so in theory I could get his gear in order and start doing heart of fear or something like that to get him high enough to queue for Throne of Thunder. Additionally I really do want to get my rogue up so I can have a transmute spec person again. I spent a good amount of last night prior to our 10 man catching his herbalism up so he can now at least harvest whatever I come across in northrend. In the past when I have quit the game I feel like it has been because I lost sight of the things I wanted to complete. I feel like I almost need to create a World of Warcraft Bucket List. There are so many little things that I forget about that I do want to complete. There are so many pets and mounts that I could be spending my time farming. The entirety of all of this is really almost overwhelming. I have never completely loremaster for example, and that’s a thing I have always wanted to do. I doubt I will ever work on the Insane title like Rylacus, but I am sure there are hundred of other little bullet points that I would actually enjoy. I feel as though if I had a list of these all, it would be much harder for me to lose sight of the progress I am making towards the total. As a result I think I am going to add a new section to my site, similar to my beta list for my WoW Bucket list. As I think of more items I will add them to the list and then as I complete them… I will check them off the list. Probably will keep it as a google spreadsheet for ease of use. I’ve seen a few other players with these and I thought they were pretty cool. All I know for certain is that I am having a blast with all the players that seem to be back from their own hiatus. It is wierd to see my battletag/realid lighting up with players I have not seen in years. At the end of the day, this game really is about the people you play it with. I am getting around super late this morning to make a blog post. On a whim I decided to take Friday off, since for my wife it was her fall break. I figured the two of us could hang out around the house or do whatever. Then over night I noticed a rather frantic message from my boss. It seems like after 5 his boss had requested something by noon today… that would involve a lot of feedback and information from us worker bees. So as a result I got up around 8 am, got dressed, went out and grabbed breakfast and have been remote into work for the last hour working on the list of information. As a result… my normal early morning post is delayed. 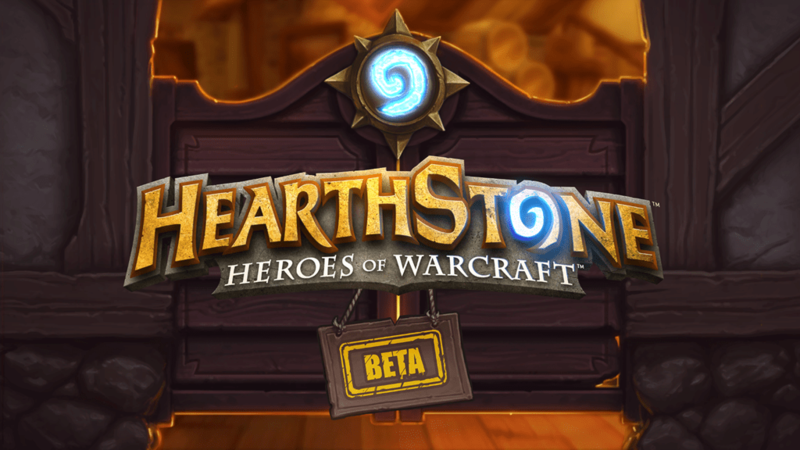 Yesterday I was extremely pumped to get home, because over night I seemed to have received an email from Blizzard saying that my account had finally been flagged for the Hearthstone beta process. Since everyone and their brother is live streaming this on Twitch… I am assuming there is no actual NDA going on… or at least not one currently enforced. So as a result I snapped multiple pictures last night as I played and will be weaving them in here and there. I have to admit I went into this a bit skeptical… not really sure if I would like it or not. From the video I had seen, everything about the game feels rushed much like a LFG dungeon group. Even though you rarely think more than one round ahead… there is still a lot of strategy going on. Day has a really good series of videos walking through his first experience with the game, and I highly suggest you watch it if you are curious about how you get into the game. Basically Blizzard has done an amazing job of user education, in that to get started in the game you HAVE to play through a tutorial. Fortunately it does a really good job of slowly introducing you into the various mechanics, and as a result you can pick up the strategy of the game extremely quickly. You play through a series of NPC card fights…starting with Hogger and finishing with an Azerothian Super Villain that I won’t spoil for now. Once you have finished with the tutorial it has taught you basically everything there is to know about the Mage deck. Essentially the decks are all themed after one of the World of Warcraft classes. I notice that Deathknight is conspicuously absent… so they must be intending to add that in as an expansion opportunity. For those who are familiar with the Duel of the Planeswalkers series of MTG games for consoles and steam… you will be used to the way you progress from here. Now you can take your mage deck and challenge the other classes, by defeating them you unlock the ability to play as that class. The biggest surprise for me is just how sticky this game was. I got home around 5 pm and started playing around 5:30. I ended up playing this game without pause until around 9:30.. and only then because some guild members needed me to tank a FFXIV dungeon run. I have to say that is fairly unheard of for me, when it comes to card games. I have copies of all of the Duel of the Planeswalker games that have been released, but have maybe logged 50 hours total among ALL of them. There was just something about the physical card game experience that never quite translated to the online version. Last night over the course of the evening, I managed to unlock all of the different class decks. At various points through the evening I was rewarded with either gold or actual packs of cards. The game uses a quest like system to give you little goals to work towards. If you look above you can see that in the screenshot I have 2 of the 3 wins needed to earn 10 gold. 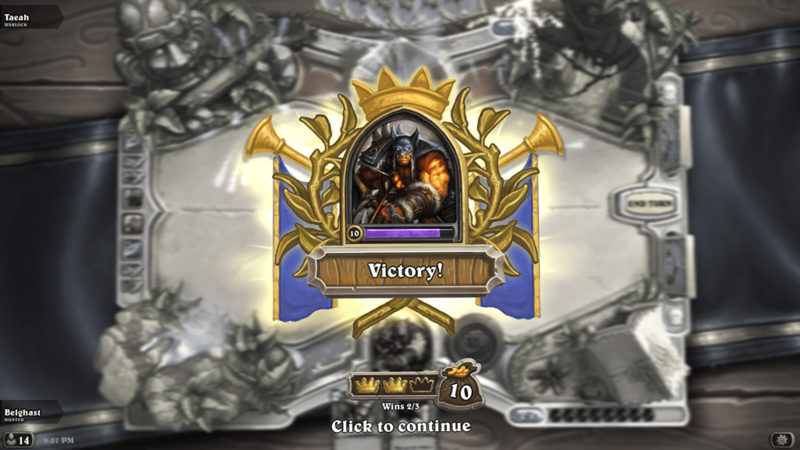 There was another quest I had to level one of the classes to 10, and in doing so I unlocked a pack of cards. 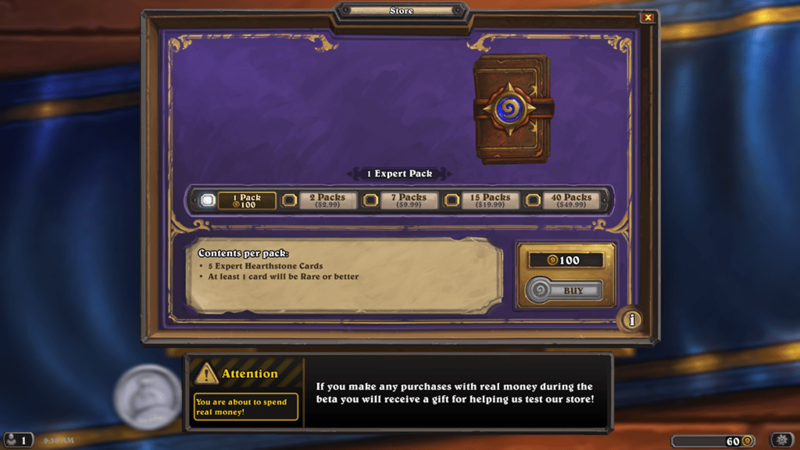 Essentially it seems like there are two kinds of cards you can get… Basic cards that are unlocked through completing quests and scenarios and leveling… and Expert cards that are unlocked through either purchasing or winning packs of cards. Since this game is free to play, you have to be asking yourself… where do they make money. Well like always with any card game it is in the packs. I took a screenshot of the current store interface. You will notice that the packs that be bought with either in game gold currency that you earn by completing achievements or be purchased with real world currency. You can purchase a single pack with 100 gold, 2 packs for $2.99 ($1.49 each), 7 packs for $9.99 ($1.42 each), 15 packs for $19.99 ($1.32 each) or 40 packs for $49.99 ($1.24 each). So as you can see in buying in bulk like you would expect you keep getting more and more of a discount on the per pack price. Through the course of play last night I earned 5 packs of cards either through a combination of gold or actually winning the packs outright. I have to say the sound design and animation are amazing… and really capture the same excitement of opening a real pack of cards. You can double click the pack to open it… or for a more tactile experience drag it open. Similarly all five cards in a pack come flying out onto the screen… but do so face down. This allows you to flip them over one by one similar to sifting through a physical pack of cards. They know their audience well and have put in a number of tactile hooks to increase the sense of suspense to see if you have something good or not. Currently you have the option of playing progressively harder NPC decks, or setting out and playing some physical players. Quite honestly I have found playing players a bit easier than playing the expert decks. There are two PVP modes of play… the first of which is simply building a custom deck and then taking it on the road to fight against other players. 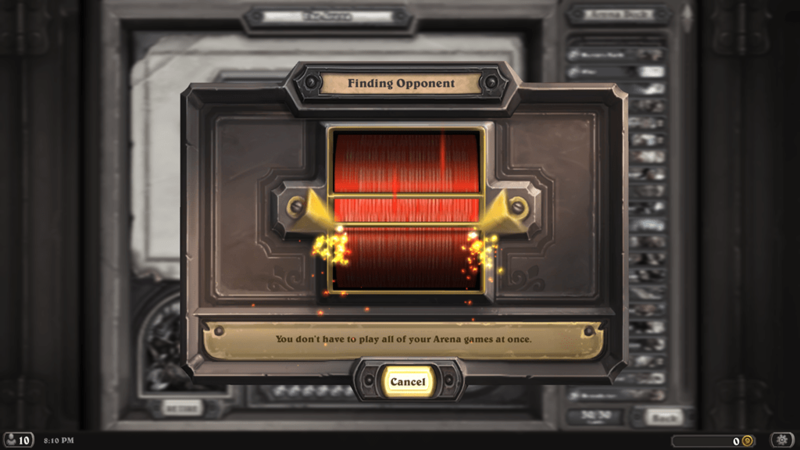 The second of which is the Arena, which serves as this games “draft” mode, giving both a more random experience but also potentially a more balanced one. I am not sure if this regenerates but you get at least one free Arena token, after that it appears to either cost 150 in game gold or $1.99 to unlock additional tokens. In the Arena you choose a class and then are presented with a series of three cards. The card you keep goes into your arena deck, and the other two are discarded. This continues on until you have chosen 30 cards for your deck. An Arena deck lasts until you have lost three times. At the end of the match you are rewarded based on how well you did. 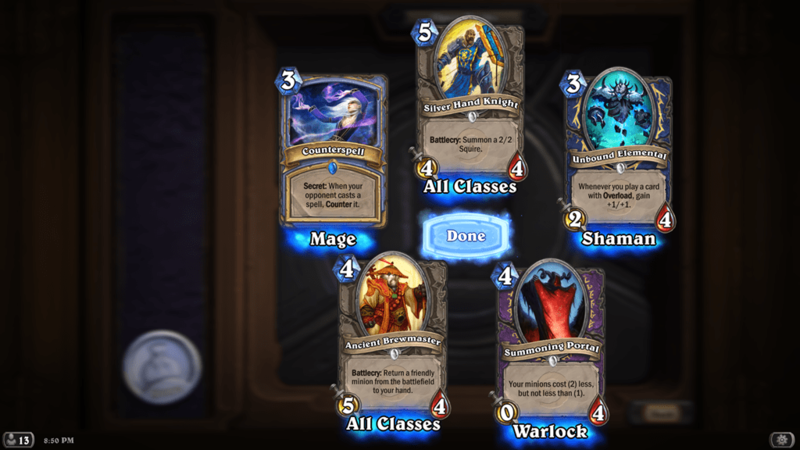 For me I got 2 sacks of gold 2 packs of cards and a rare paladin card for playing. I won three times and lost three times. 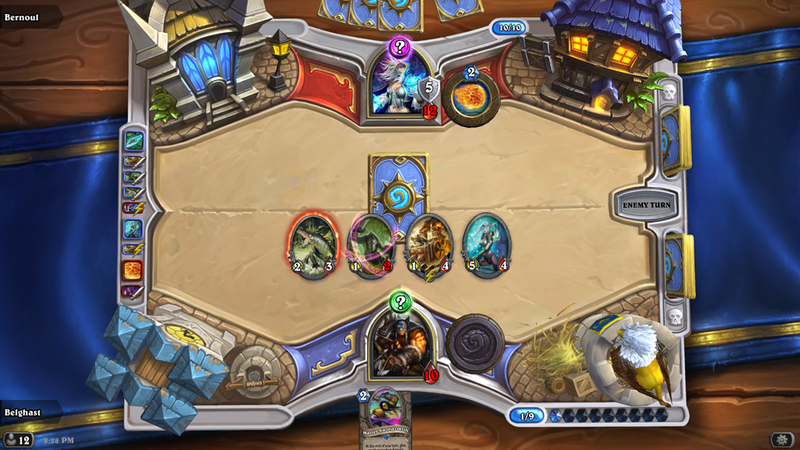 The interesting thing about the Arena is the fact that you don’t have to play it all in one sitting. So long as you have not lost your three matches you can continue playing arena. There is some bar of gems that fills up each time you win, but I am not 100% certain how that works. You might get punted out of the Arena if you win too often as well. Last night I played through a single arena match and then was off playing custom games with players. My little hunter deck seems to be doing pretty well, so I will likely return to doing some of that today. 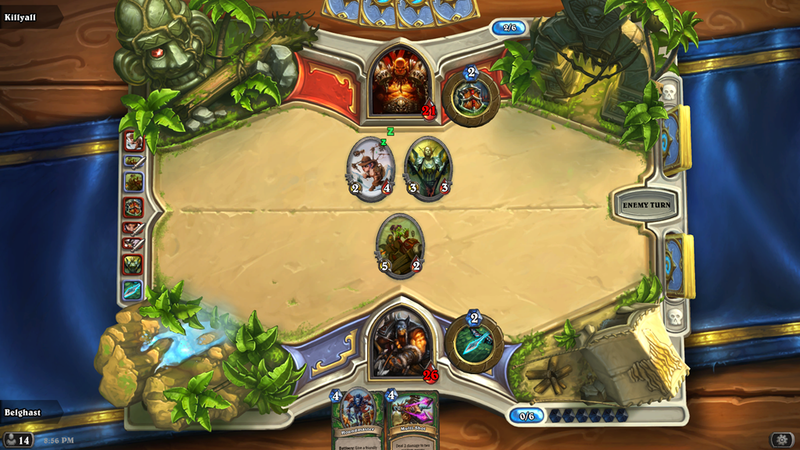 I have to say I am very pleasantly surprised in just how good of a game Hearthstone is.